The report shows the company’s latest achievements for its Blue Planet sustainability initiative and continued progress toward its four sustainability goals. Last month, Phoenix-based Republic Services released its 2015 Sustainability Report, which shows the company’s latest achievements for its Blue Planet sustainability initiative and continued progress toward its four sustainability goals. 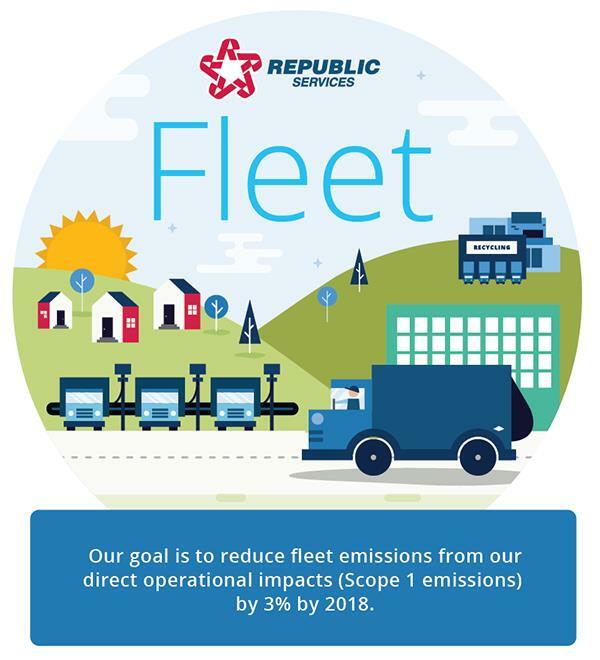 These goals go hand-in-hand with Republic’s sustainability platform, which is comprised of five main elements: operations, materials management, communities, safety and people. In addition to releasing its 2015 Sustainability Report, Republic has scored in the 90th percentile of the Commercial Services and Supplies sector of the 2016 Dow Jones Sustainability – North America Index (DJSI) and was named to both the 2016 DJSI World and North America indices. The rankings showcase the company’s leadership in corporate governance, environmental, social and financial aspects of sustainability. 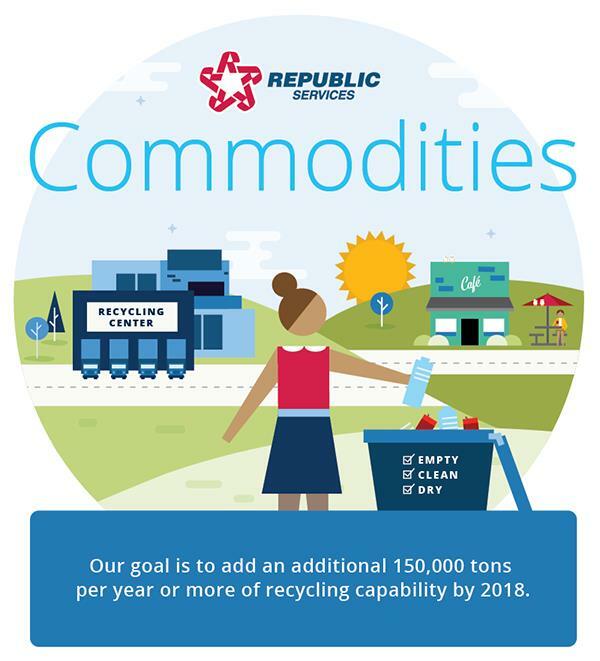 To decode Republic’s 2015 Sustainability Report, Waste360 spoke with Pete Keller, Republic Services Vice President of Recycling and Sustainability, about Republic’s approach to sustainability, the company’s goals going into 2018 and what sustainability efforts we can expect to see from the company in the future. 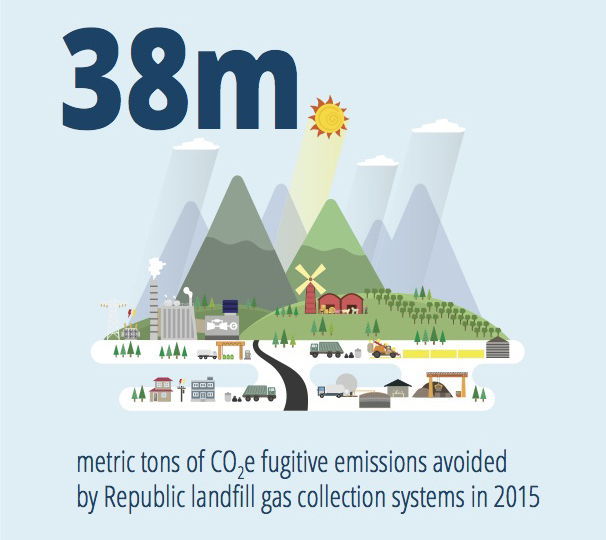 Waste360: Tell us a little bit about Republic Services’ latest sustainability report. 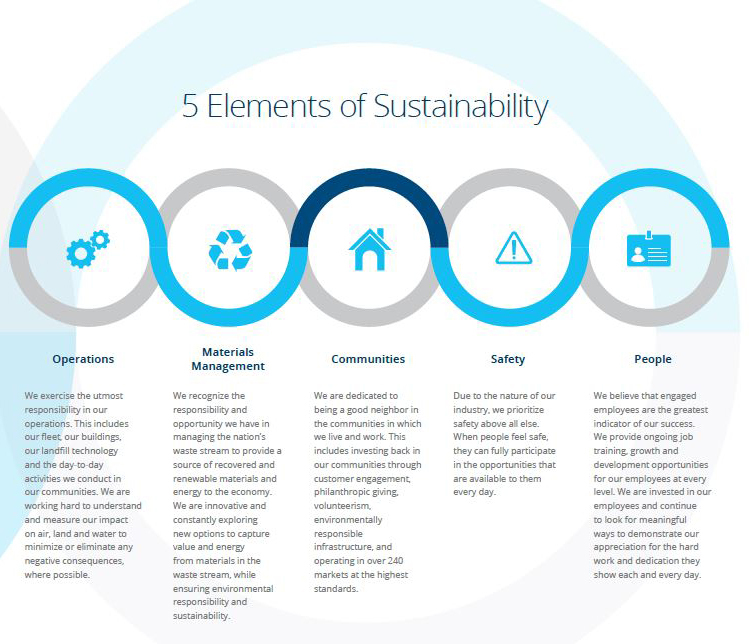 Pete Keller: We have developed a multiyear initiative in and around what we call the five elements of sustainability, which include operations, materials management, communities, safety and people. Sustainability is a big bucket, and we have found that most folks have a tendency to just think about the environment when sustainability is mentioned. At Republic, we are trying to take a broader view on sustainability by focusing on both the environmental impact and the social and governance aspects. Our belief is that sustainability platforms cannot be successful without executive sponsorship and support from our employees and everyone in our communities. To drive those sustainability impacts out of our business, both economically and environmentally, we have a multitude of programs that focus on our five elements of sustainability. For materials management, for example, we are simply making sure that we are doing all we can do to extract resources from the waste stream. And for operations, we are continuing to grow the company with acquisitions and the best employees. Ultimately, the report shows our commitment to our Blue Planet sustainability initiative, the goals we have sent in place going into 2018 and some of our sustainability data from 2015. Waste360: Republic has set four main goals going into 2018. What strides is the company taking to achieve those goals? 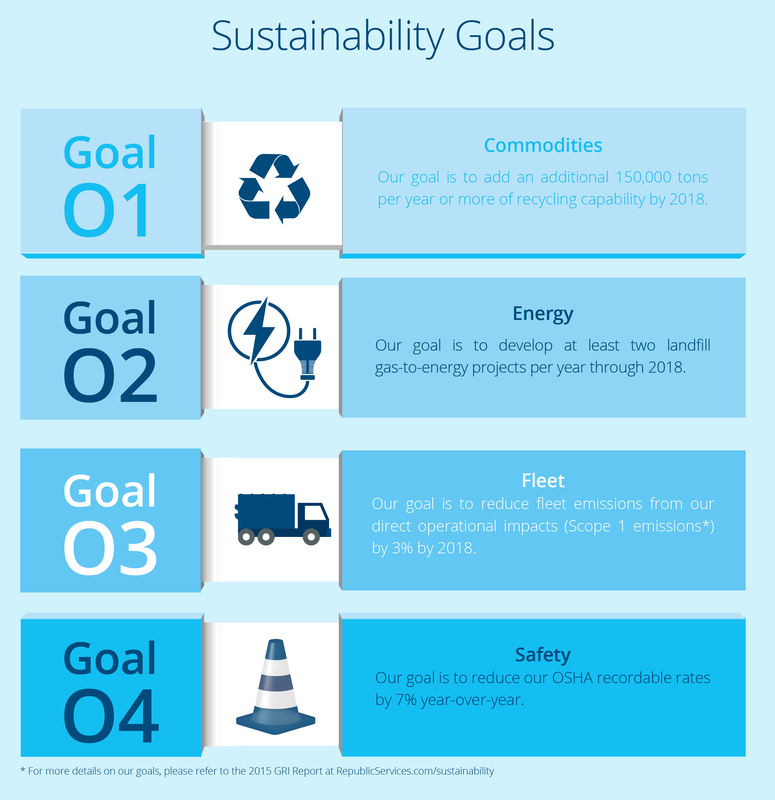 Pete Keller: We have set four main goals to hit by 2018, which include adding an additional 150,000 tons per year or more of recycling capability, developing at least two landfill gas-to-energy projects per year, reducing fleet emissions from our direct operational impacts by 3 percent and reducing our Occupational Safety and Health Administration recordable rates by 7 percent year-over-year. Over the course of the past couple of years, we have continued to make investments in structure and acquisitions, while some of the other companies in the industry have gone the other direction. It’s a difficult environment and position to be in right now, but we have been spending a lot of time looking at our contracts and business transactions. It isn’t about getting paid more; it’s about developing a durable business model that can tolerate change. With these goals, we are looking at being more transparent with our customers so that we can create partnerships within our communities and develop long-term programs that will be durable over time. Right now, a lot of companies have lost their programs in certain parts of the country, and a lot of companies have had to change their list of acceptable materials. We are trying to avoid those types of situations by looking at ways to build contracts that work well for both parties. To tackle the problem of seeing elevated temperatures at some of our sites from time to time, we have developed innovative systems to cool those sites. These systems ultimately extract the heat and bring those sites to a more stable state. This is something that has never been done before, and it’s something that we are proud of and wanted to highlight. Waste360: Looking beyond 2018, what will Republic focus on? Pete Keller: We are going to stick with focusing on the five main sustainability elements and the four main goals that we have outlined. When it comes to reducing greenhouse gas, we think our biggest opportunity to offset or reduce our carbon impact is through recycling. We believe that is where we have the greatest ability to move the needle in reducing our carbon impact and that is something we will continue focusing on even after we reach 2018. We are also looking at absolute fleet emissions. An absolute goal is more difficult than an intensity goal if we are planning on growing, which we certainly do. Every year we add more trucks, and every year we say that we will have less total emissions. We are always continuing our efforts to convert our fleet from diesel to compressed natural gas (CNG). CNG fuel has less carbon intensity, and it’s also much cleaner. We are also purchasing renewable gas opposed to fossil-based natural gas for some of the CNG trucks that we currently have in some parts of the country because the emissions benefits are more significant. In addition to those efforts, we are looking to continue to grow our recycling portfolio by adding tons to the overall business every year and bringing additional capability capacity into our infrastructure. We may also introduce additional goals in our next sustainability report since that will highlight our goals going into 2020 and beyond. As you know, right now the goals are slated for 2018, but we will be refreshing those goals and possibly adding more as we move forward. As far as that goes, I don’t really see us adding any new sustainability elements to the mix or getting away from the things that we are currently focused on. We believe that we are focused on the right things, and we want to continue to make progress in the areas that we are currently focused on.